The Sunday Times Published: 26 February 2012. Lois Rogers. A young father has become the first person in Britain to benefit from a revolutionary heart pump designed to save thousands of people who would otherwise die waiting for a transplant. The tiny pump is the first intended for permanent use. Previous versions for the heart were built with the aim of providing only temporary support while the patient waited for a transplant. 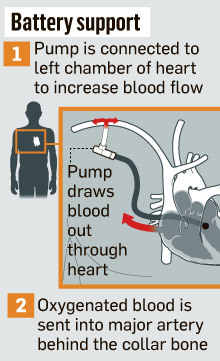 Doctors hope the breakthrough will lead to electric pumps becoming as common as pacemakers within the next five years. The step could save the lives of many patients who would otherwise die in their thirties from congenital heart disease, as well as others whose organs begin to fail in middle age. The miniature pump, the size of an AA battery, is also the first such device that can be inserted without breaking through the chest bone and stopping the heart. The operation can be completed in less than two hours and it is hoped that patients will be able to go home as soon as 10 days later. The pumps are expected to last about five years before needing to be replaced. The first patient, a 35-year-old father of two, received the CircuLite Synergy pump last week at Harefield hospital, northwest London. He has an abnormality that is causing progressive weakening of the heart muscle. He is understood to have recovered well and is expected to go home this week. The man is the first of 10 British patients who will take part in a trial of the device. A total of 47 people in Belgium, Germany, Italy and Slovakia have already received it. The youngest patient in the trial is 34 and the oldest 74. The longest somebody has lived so far after being given the pump is 2 years. About 100,000 people die of heart failure in Britain every year and, although not all of them would be suitable for treatment with the pump, many would. However, the Royal Brompton and Harefield NHS foundation trust said its two hospitals were not approved to use heart pumps as the ultimate aim of therapy. This means the patient will be reassessed in six months to see if he is suitable for the transplant waiting list. Even so, his chances of getting a transplant organ are not good. The number of such operations in Britain has almost halved in a decade, from 159 to 86, because the number of fatal road accidents has fallen.